When a 500 pound bomb explodes nearly 250 pounds of steel fragments are blasted into the soil or air. 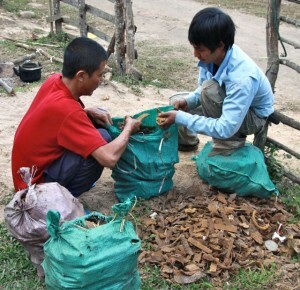 When our deminers search for UXO they must investigate and remove all the scrap that they find. As we sweep parcels of land with our metal detectors, looking for unexploded ordnance, we find prodigious quantities of scrap: bomb fragments, spent artillery shells, rifle casings, flare canisters, sometimes entire bomb casings weighing 500 pounds or more. All metal refuse must be removed from the area we are clearing or it will interfere with future work on the site. If we clear land intended for a future rice field, we’ll likely search just to plowing depth—about 30 centimeters. Later, if that parcel is to be used for a different purpose, for instance a schoolyard with drainage ditches, toilet pits and a well, the parcel will need to be searched again, to whatever depth is appropriate. If, during the initial clearance, we leave behind metal shards and other refuse, the subsequent search will be greatly slowed. It’s best that all scrap be removed from the site the first time through. 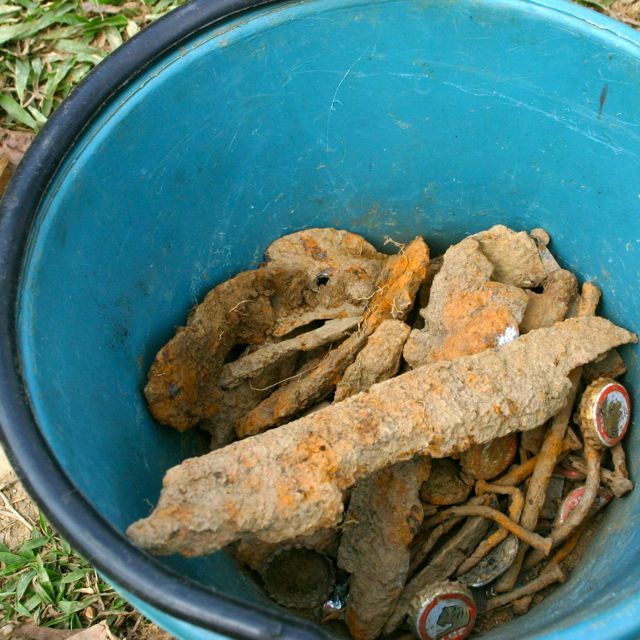 I’ve worked on sites where the contamination was so great that the team collected, literally, tons of scrap: steel bomb fragments, aluminum flare tubes, brass rifle casings, copper wire and more. And, no matter what the mission entailed—garden expansion, school construction, road building…whatever… the deminers who found the metal, dug it out of the soil and hauled it back to camp, considered the scrap theirs to sell. Each team of deminers carries a bucket and is expected to collect all the scrap they find in the course of their search. The goal is to leave land picked clean of both ordnance and scrap. For years I’ve argued in favor of the village keeping the proceeds from the sale of scrap and on every project I’ve forced the issue by inviting the village chief, or nurse, or head schoolteacher to cart the stuff away. The deminers have always felt robbed and abused by my action. They’ve argued, perhaps with some justification, that since they aren’t paid until the end of a month they need the money from scrap sales to buy soap, cigarettes, phone cards and other incidentals that make camp life more bearable. Their recourse? Inevitably, if the guys see no benefit to themselves they become careless about collecting the scrap. The deminers don’t search with any less vigilance, but with no profit motive there’s a tendency for them to leave metal in the ground that should be carried from the field. I’m not yet won over to the guy’s position. I’m just that stubborn. I still feel that, rightfully, the stuff that comes out of the farmers’ land should benefit the farmers and their children. But… I’m tried of the fight and have decided to capitulate. Today, I officially, publicly surrender. In this project the guys can sell all the scrap they haul from the field and divide the money among themselves as they see fit.